We've developed templates and step-by-step guide to using email marketing for growth hacking. Browse our selection of free email templates to find one that you can use for your growth marketing projects. We're an invitation-only community of American dentists and Medical professionals. Our sole aim is to help them put their best foot forward. We would like to offer you the opportunity to join our free, invitation-only community of medical practitioners to help increase your web presence and to reach new patients. This exclusive program will help you start and grow your independent practice. All you need to do is to signup for free. We recently sent you an invitation to an exclusive community of American dentists and Medical professionals to help you put your best foot forward, increase your web presence, and reach new patients. Please note the new batch of entries for free signup closes today, if you haven't already we request that you register now. We wanted to let you know that after a few weeks of research and analysis, we have named you one of the Top 100 Marketers in London. Our research process was based on current and potential growth/influence on the market. You can find the complete list here: Top 100 Marketers. We have also been asked by a few publishers to do a follow-up post in regards to the top tools some of these growth hackers use. Would you be available for comments? Subject: Could you join us? I'm writing to see if you could join us and other Fixed Operation professionals for an exclusive web event. 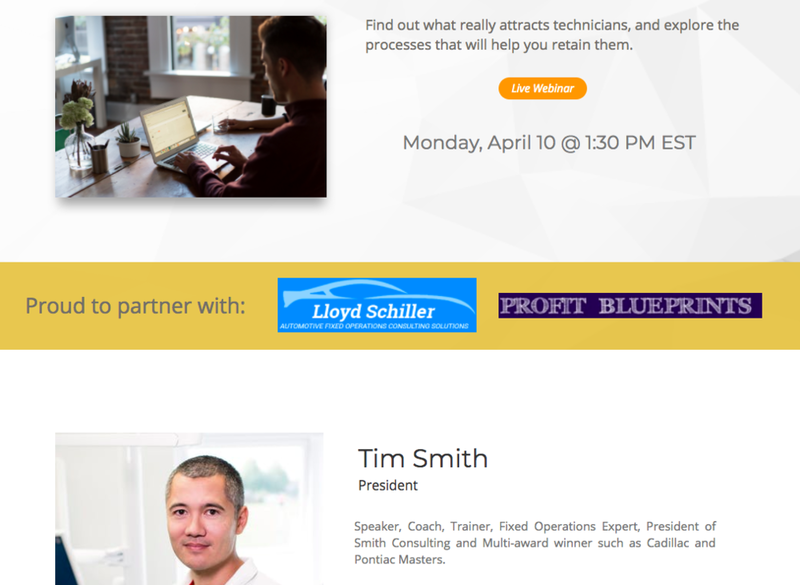 Tim smith, renowned Fixed Operations Expert and President of Smith Consulting, who has been featured on CBT News, and is a noteworthy author for Fixed Ops Magazine, will be hosting a groundbreaking webinar detailing "New Techniques to Find and Hire Automotive Technicians" on April 10th, at 1:30pm (EST). We only have 8 spots remaining and wanted to see if you could join us? We recently sent an email inviting you to a Webinar, "Improve Your Success at Hiring Technicians", hosted by Tim Smith who has been featured on CBT News and is a featured author for Fixed Ops Magazine and Dealer Magazine. As a speaker for some National Automotive Conferences across the US, such as Digital Dealer, AICPA, and AutoCPA, Tim has some valuable insights to share. The event is scheduled for April 10th, at 1:30pm (EST). The webinar takes place in under two weeks. We would love for you to be there. Can you please mark your attendance by registering here. To avoid disappointment and ensure your spot on the day, you can pay now via PayPal here. Lisa Griffith is a one of the fastest growing salon franchises in New York. We help beauticians earn more, and increase their income by 134%. We help beauticians increase their income by 134%, for example: If your last year’s pre-tax income was $50,000, it will be $76,000 at Lisa Griffith's; in addition to bonuses. We will like to extend a special invitation to meet with some of industry's most famous celebrities and have one to one chat them. Free signup ends tomorrow (Friday). We recently sent you an invitation to have a one-to-one chat with a specialist in order to help you increase your income by up to 134%. Lisa Griffith's is a new salon concept that is locally owned and managed by stylists. Please note the new batch of special invitations for free signup closes today, if you haven't already we request you to register now. Images you should put within the emails. These should link to your landing pages. 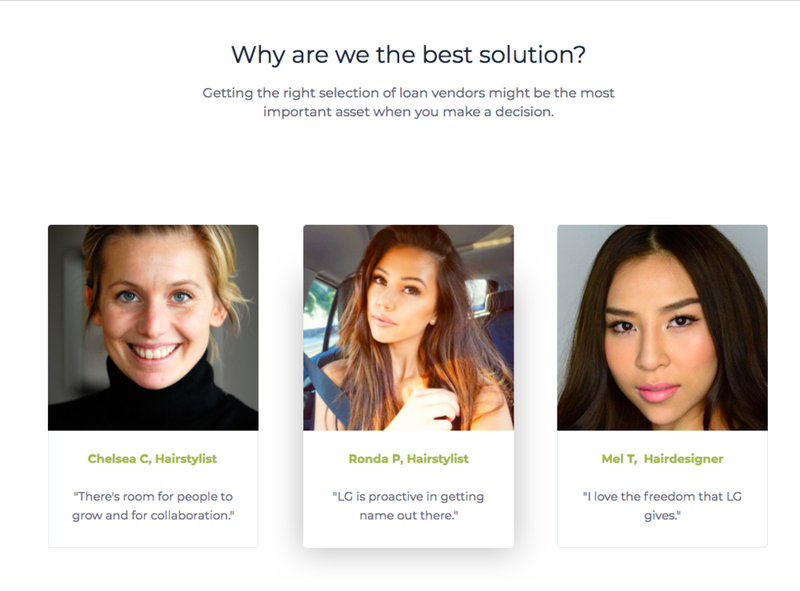 The "fear of missing out" is a major motivator for potential clients/signups. Create a one-time offer that inspires them to sign up for your event or to try your product/service. "Exclusivity" is another major motivator. People like to feel special; they enjoy being singled out as someone important enough to join a selective group. Create a sense of importance for your target audience and you'll see some fantastic results. People like to be invited to exclusive online events. They're more likely to sign up for an event that they've been singled out for, rather than one they've stumbled on themselves. Create that sense of importance by developing a webinar invite that looks professional and engaging.